This pack contains all F-15E Strike Eagle variants and above. 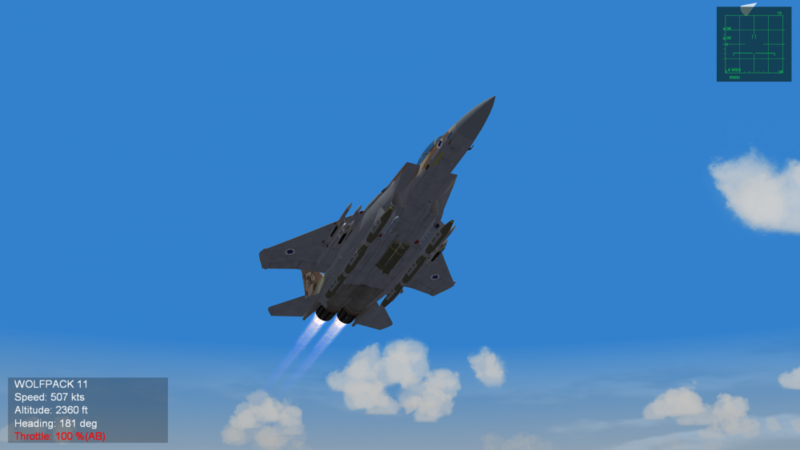 If you want the F-15A thru D Eagle variants (including Js), you can find them here. What's included in this mod pack? 1) All NEW 4096x Skins in JPG format and tons of new decals (also includes optional 2048x skins). 2) Repainted Cockpits by Viper63a and RWR list by Spudknocker. 3) All NEW updated Data and Loadout files from Spudknocker and Fanatic Modder. 4) All NEW 1920x1080 *Hangar.jpg, *Loading.jpg and *Loadout.tga (also includes optional 1024x768 screens). 5) Excellent new weapons and ejection seats from Ravenclaw_007! 6) Excellent Florian Pilot upgrades by JAT81500! USAF: 16WS (OT), 90FS (AK), 333FS (SJ), 334FS (SJ), 335FS (SJ), 336FS (SJ), 389FS (MO), 391SF (MO), 492FS (LN), 493FS (LN) and 494FS (LN) Squadrons for F-15E, F-15E (00), F-15E (04), F-15E (14) and F-14SE. HAF: Fictional 336th (Olympus) Squadron for F-15H. IAF: Two variations of the Israeli 69th (Hammers & Sixty Niners) Squadrons for F-15I and F-15ISE. 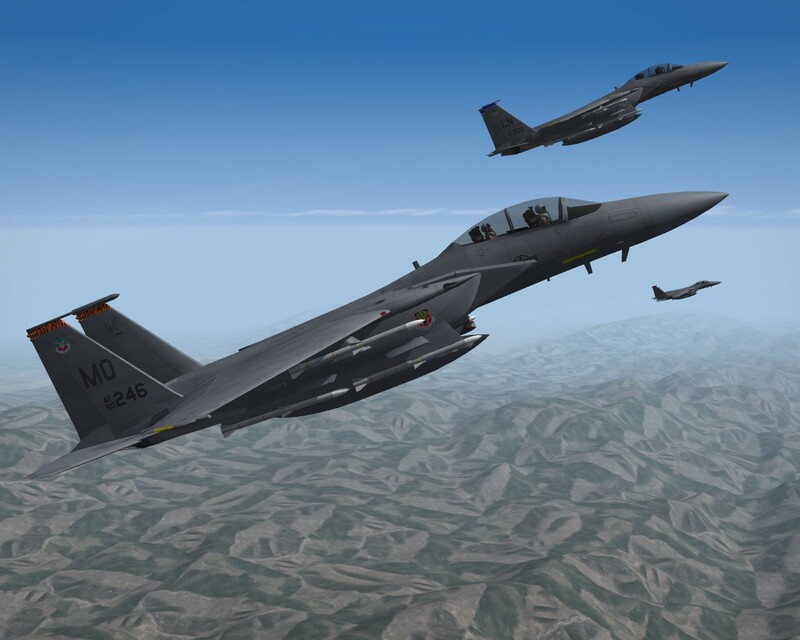 RoKAF: 102nd (Blue Dragons) and 122nd (Jaguars) Squadrons for F-15K and F-15K (10). SAF: 92nd Squadron for F-15S, F-15S (15) and F-15SA. RoSAF: 149th Squadron for F-15SG. GAF: Fictional Jg71N90J, Jg72N90J, Jg73N90J and Jg74N90J Squadrons. 1) Install Additional/Alternate 1024x768 and 1920x1080 Hangar and Loading screens. 2) Install 1024x768 Hangar and Loading screens. This pack has 1920x1080 screens by default. 3) Downgrade the default 4096x to 2048x skins if you have performance issues with the larger skins. !! 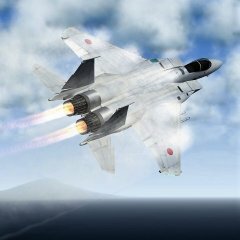 DO NOT DELETE the stock TW "F-15A" and "F-15A_Baz" folders! This pack DOES NOT REPLACE stock TW F-15s! b) Copy the contents of the uncompressed "To_Mod_Folder" folder into your Saved Game mod folder. Overwrite any conflicts. a) Copy the contents of the uncompressed "To_Mod_Folder" folder into your Saved Game mod folder. Overwrite any conflicts. Lastly, this is highly recommended. Read the "Add F15 SoundList.txt" readme file on adding the F-15 sound files included in this pack to your "Flight\SoundList.ini" file. Viper63a - Upgraded Skins, Decals, Cockpit and Menu Screens. Spudknocker - Upgraded Flight Model and Weapons Loadout. Fanatic Modder - Upgraded Flight Model and Engine Emitters. RavenClaw_007 - Freaking insane Weapons and Ejection Seats! JAT81500 - For the excellent Florian Pilot upgrades! Hi Ho Silvers - AfterBurner Mod. The Mirage Factory - For the nice F-15D MSIP aircraft...in particular Flying Toaster, wpnssgt, and Dave for making the F-15 MAX files available for me to play with. Kei Nagase - For the awesome skins for the F-15 ACTIVE. AleDucat - For the nice ACES II ejection seat models. Kout - Loading and Hanger Screens. Kct - Textures and decals for the F-15SG. JAT81500 - F-15E Cockpit avionics and HUD work. 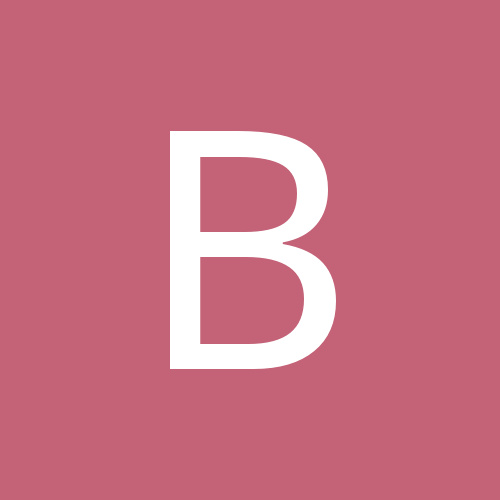 To my fellows at Combatace for helping me beta test and work out bugs. 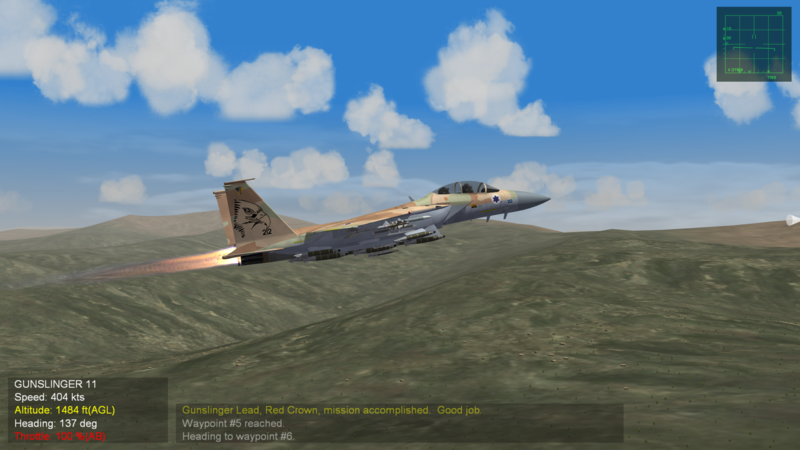 This pack contains the F-15E and up from FastCargo's F-15 Super Pack and more. Nearly every part of the original pack has been upgraded. All new jpeg skins, decals, screens, flight model, loadout, pilots, (some) weapons, and cockpit...etc...etc...etc. Because all these differences, there are special instructions to install this mod over the original F-15 Super Pack. But it will be well worth it. Different emitters for all 3 types of engines used PW-F100-220/229 and GE-F110-129, different pilots for each country represented, different repurposed sound files! Tens of loadouts to choose from (read the *LOADOUT.INI file, there are instructions there to set\change your default loadout for a mission profile), multi-tude of decals - you can choose different planes in the same squadron and the decals can be different. There are nearly 20 authentically serialize jets for each squadron. So, you can fly up to 8 different planes within one squadron and they can all be unique! Including Squadron, Wing and AF commander planes! Illuminated cockpit...I can go on and on and on! Spudknocker, Fanatic Modder and I (with some help from new friends - Raven and JAT - THANKS!) loaded up this mod with everything we could think of and was in our skill sets to implement....Enjoy! Another beautiful package, well researched and planned. Thanks to everyone involved into this project! No Worries blaze! It was fun to help make something that everyone at CA would love to play with! Uploaded v1.01 - Has nozzle corrections from Fanatic Modder for exported F-15I, K, S, and SG. Also include some really nice upgraded weapons from Raven. If you already downloaded the original v1.0, you just need the patch. The original v1.0 pack was removed and replaced with the full v1.01 Super Pack for new downloads if you want the upgraded full pack. V1.03 uploading. Minor skin tweaks...nothing else. Brings the skins up to the same level as the F-15 Eagle Pack we're getting ready to release. > Calibrated Gun Aiming - Reported by Stick. > Removed Outer Pylons, corrected typo and adjusted loadout - Reported by HolyKnightAD. > Skin enhancements to bring them up to the same level as the F-15A/B/C/D Eagle Pack level. 1) Tweaked AB emitters colors. 2) Tweaked Exhaust emitters density. Planes VERY VERY cool, but cockpit low polygonal. However thanks for good mod. I like "Strike Eagle". 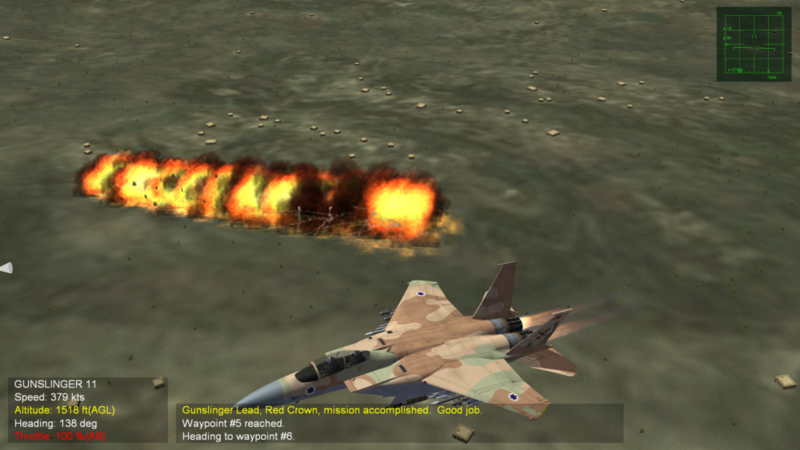 Laser JDAMs don't drop, especially from the "Silent Eagle" variants. Center SDB rack shows but won't drop SDBs. Oh and... More fun than anybody ought to have without reading several hundred pages of manual!!! Really nice to blow up Hezbollah rocket launchers in one pass! Stick, being I'm not an elite member any advice as to, " revert to the weapon data entries and corresponding loadouts provided in this download package "? I downloaded the .7z file. I would love to be able to play with loadouts too... some airplanes need more types of weapons, some less. All freeware work is much appreciated by me! I will come back to you over the weekend. So pull up the data.ini's from either pack and look for the CFT station entries. Compare both and I'm sure you will find incongruities, e.g. center CFT stations configured to carry 2000Ib bombs. I'd change the length limit too, but rather let the original developer do it as they know just how long the GBU-12 is! Oh and here's a couple screenies from a test flight with the Silent Ra'am & V4 J-DAMs. Used the same code until the developers have a better fix. Have to say reducing 8,000+ pounds of weight is much appreciated. Also devs, the F-15E_14 needs way better GBU-39B Small Diameter Bomb (SDB) compatibility... they're not supposed to hang like pictured below on the F-15E. Instead, see HERE and HERE from Raytheon for better examples. Really be awesome to have that capability on your jet... a certain game-changer. you do realize, that the guys that built these are no longer with us, right? So don't expect any updates from them. Unfortunately, my BRU-61 SDB racks are messed up (I'm not sure why), but it is definitely possible to mod the F-15SE to have SDB racks on the LCFT_Station1, RCFT_Station1, LCFT_Station3 and RCFT_Station3. It takes a fair amount of trial and error as I found out. Roll angle values on the BRU-61 stations could be the culprit. a) If you stick to the racks as per the above picture and can prune the stray SDBs above them, that'll be as close to 100% real world accurate as we can get. I really hope we can keep this Strike Eagle as real world & relevant as possible! b) Sorry for late response, had shoulder surgery done last Tuesday so going to be a week to two at least before I fly SF2 again. But please pass your code in this thread. Maybe I can put something together as a friendly advisory patch this fall... ;-).